If your living room has a modern design, you’re going to want a TV stand that will match it. There are a variety of different stands and stand designs that you can choose to complement the style that you’ve already got going on. We’ve chosen only the best TV stands so that you can make an informed decision about which one you’d like to purchase. Let’s go over some information first! Material: What the stand is made of is important. It can make the stand sturdier, make it last longer, and give it a more appealing look depending on what you’re going for. The material should definitely inform and influence your choice. TV Size: This refers to the size of the largest TV the stand is recommended to hold. In areas where there was an ideal size versus a maximum size, this is listed as a range of sizes. Finish: The finish is, ultimately, what color the stand is on the outside. You obviously want a stand that’s going to match your décor and your living room without clashing too badly, so that’s where this comes in handy. Weight: The weight of the stand is also important. You’re going to want something that can stand up to how you’re going to use it. A heavier stand, for instance, would probably be better for people with small children. 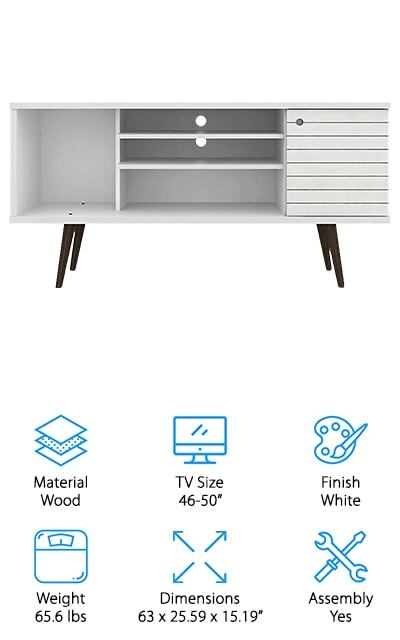 Dimensions: The dimensions refer to how large the TV stand is, and therefore where it will fit. If you have an optimal space for the stand, knowing how big it is should help you decide if it will go there. Assembly Required: Just about every stand on this list has some sort of assembly that will need to be done when you receive it. Most are simple, though some are a little more complicated and intensive than others. Now we can get started with our TV stand reviews. We’ve done all of our research in order to bring you the best selection available right now. This includes stands for just about every modern or contemporary style that we could find. Our top pick and budget pick are our favorites, so you should check them out before making your way through the rest of the list. Our top pick is this contemporary TV stand from Monarch Specialties. It’s inspired by the art deco movement, with its asymmetrical sides and shelves. On one side is a storage drawer while the other shelves are open, including the top area where you’d place a TV up to 47 inches. It’s a dark taupe color that’s going to look beautiful with your living room décor no matter what it is. The panels of wood are thick and sturdy, and the feet are metal cylinders that hold it up while still looking stylish. They perfectly match the drawer accents as well. This entire piece is a work of art rather than a piece of furniture, and we love that! You will have to assemble it, but they offer assembly as an add-on charge if you find that you don’t want to bother with it. 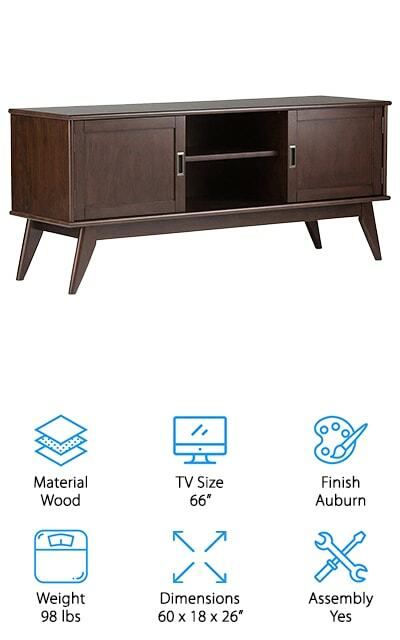 We love both the finish and the style of this TV stand. 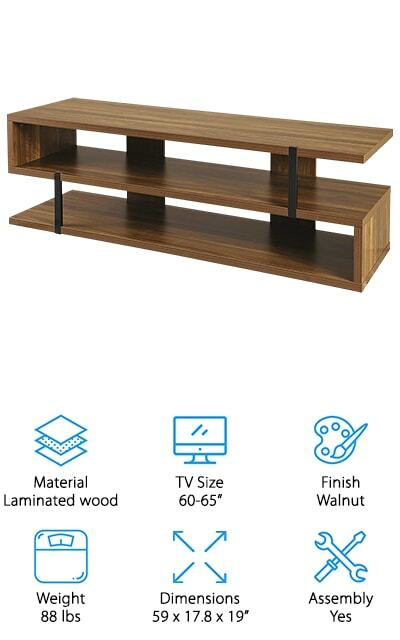 The best cheap modern TV stand that we’ve found is this Emmett stand from Ameriwood Home. It can hold up to a 42-inch, 50-pound TV and it has plenty of storage for all of your entertainment. It’s a pretty simple design, with a metal frame and two light oak shelves. It might be a cheap TV stand, but that doesn’t mean it has to look like one. You can use it as either a TV stand or a coffee table, and it would be a good fit for either depending on what you need in your home. 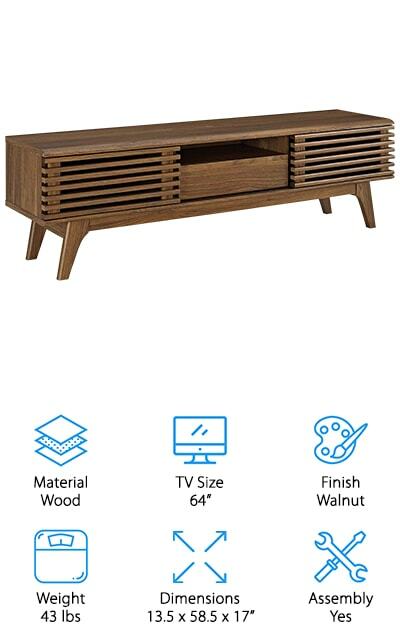 The Draper by Simpli Home is a modern wood TV stand with traditional influences. This is the type of stand that you’d expect to be in every home, under ever TV. It’s finished with a nice auburn brown finish that’s lacquered so you get a better look at the grain of the wood. Each piece is unique. It’s made of solid rubberwood, so there’s no particle board here! It’s sturdy and modern, with tapered legs that angle out instead of being straight down from the stand. It’s a nice mid-century Modern touch. The pulls for the two cabinets are antique brass and recessed into the doors. It’s another nice detail that makes this modern TV stand. The shelf in the middle is adjustable and can be used to hold all of your entertainment accessories, from consoles to movies and games. The side cabinets also have adjustable shelves, for everything you need to store there. 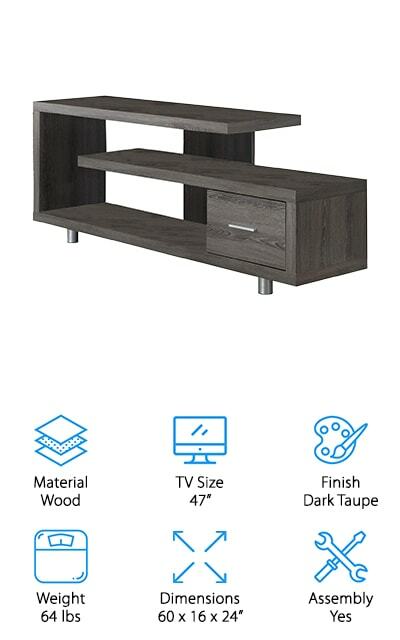 This modern TV stand is great for apartment living or saving space because it has three functions: you can use it as a TV stand, as a bookcase, and as a display cabinet for knick knacks and other miscellanea. But the great thing about this stand is the fact that the parts can be moved around to get the configuration you want. You can move the shelves a little more to the interior to get a shorter stand if that’s what you want, and you can take shelves out as you see fit. The board it’s made with is lightweight but sturdy, with a melamine finish so it’s easy to clean and resistant to scuffs and scratches. The shelves on this particular model are thicker and you can get it in white, oak, and espresso colors as well. These interlocking L-shaped shelves are pretty amazing! It works well for any TV from 50 to 60 inches. Modway makes this charming mid-century TV stand that’s low-profile and versatile. It’s a great understated piece for your modern living room. It features tapered legs and slats across the front of the cabinets. These doors slide to reveal storage areas with adjustable shelves and a center gliding drawer where you can keep all the loose accessories that don’t fit on the shelves. 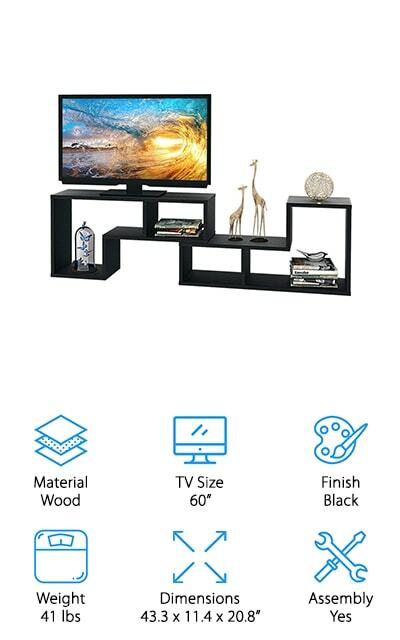 There’s so much storage room in this short but wide TV stand! One of the features that we love the most about this stand is the various cutouts and holes for cord management, so your area can remain neat and your cords can be up and away from pets and children. It’s got a strong frame and a natural wood veneer that looks beautiful in any setting. 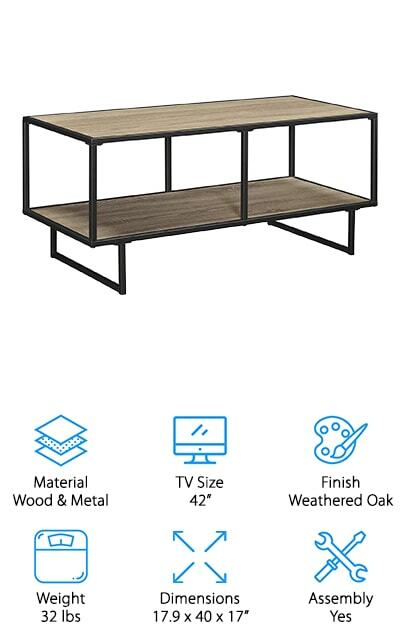 There are so many contemporary setups that would look even better with the addition of this wide TV stand with its sophisticated appearance and sturdy construction. 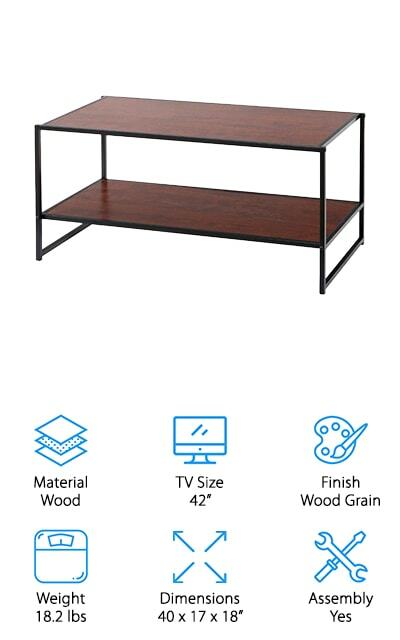 If you’re looking for a minimalist TV stand that will have plenty of storage and table space for you, you might want to look into this Zinus table. The surfaces are finished in a brown wood grain that’s glossy and easy to clean while the frame is made from square steel tubing that’s sturdy and is great for holding up to 100 pounds on its combined surfaces. The lower shelf is perfect for holding decorations or any additional movies or music media. We love how functional this TV stand is in addition to being stylish and perfect for any smaller living room. You can even use it as a stand to go under your TV, or a table for when you first come into the house. It has so many uses, and we think that’s pretty amazing. It’s a great design choice for when you need something simple that still meets all of your needs. This freeform wood TV stand from Martin Svensson home is the perfect addition to a host of contemporary looks. It’s a freeform stand with three shelves that make an ‘s’ shaped design together. We love the asymmetrical pieces and this one is outstanding. There’s so much room for different gaming, audio, and video equipment, or even speakers and decorative items in this case. It can hold TVs up to 60 to 65 inches wide, with a weight limit of 110 pounds. The open-air design of the shelves also gives the stand a certain charm. The laminated wood grain is easy to clean and dust when you need to, and the legs are coated with black powder to help stabilize the shelf and that adds to the overall look. This simple, unique shelf is definitely on our list of favorites, and we’re sure that you’re going to love it as well – it’s going to look great in your living room! This white modern TV stand is perfect for a smaller living room or a simple set up when you don’t want something flashy or overly large. It still has plenty of storage while being sturdy enough to support a TV of up to 46 to 50 inches in width. It’s got open shelves and cabinet space so you can store all of your entertainment equipment without having to purchase additional storage. The assembly instructions are detailed so that you can easily put your new shelf together. The splayed legs on the bottom of this shelf add another dimension of style and sophistication to the design, and we love it. It’s practical and has a mid-century retro look that you are sure to appreciate! If your living room décor will match this dichromatic design, we know that you’ll love how it fits perfectly into your life! All of the storage space is incredibly useful and functional! 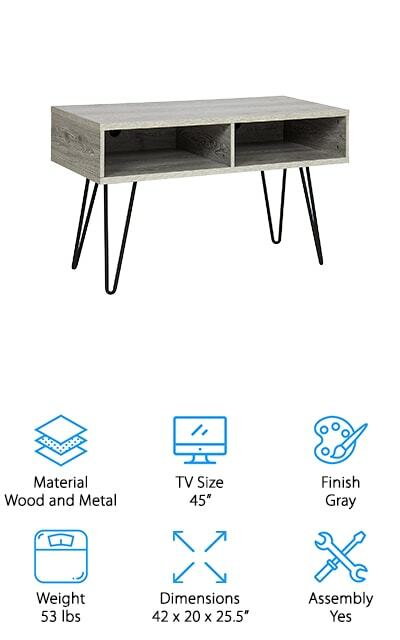 If you’re looking for a fancy TV stand that will break the mold in your modern apartment or the living room of your stylish house, this Is the one for you! It can fit up to 90-inch screens, so it’s great for larger TVs and you know it’s going to take up a lot of space. That means a lot of storage! The finish is a high-gloss black, and the thing that we love most about it is that the entertainment cubby has built-in LED lights. There are sixteen different colors that this one can have on to make your space look modern and trendy. It even has a remote to turn the lights on and off with the click of a button. The instructions are easy to follow and you’ll have it assembled and put to work in no time at all! 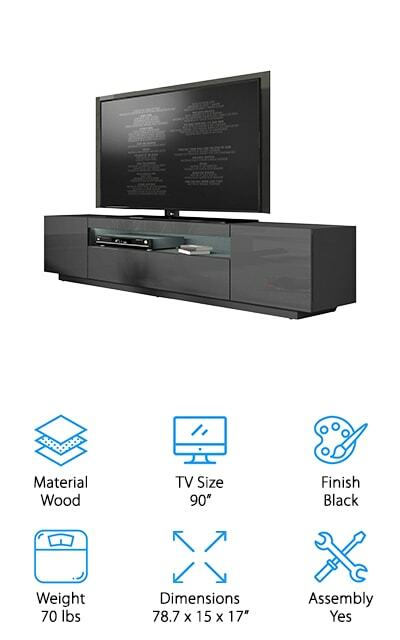 We love the high-quality materials that this TV stand is made from! It’s high tech and sleek! The last TV stand on our list is a retro throwback. This grey hardwood cubby-style stand comes with metal hairpin legs, which makes it look like its right out of the 1960s. It’s a beautifully sturdy piece that is also just industrial enough to look great in an apartment with exposed brick walls, for instance. It has clean edges and two large shelf cubbies where you can place your audio equipment, gaming consoles or other things. There are holes you can thread your cords through so they are neat and managed. We love how much storage space there is, paired with the large tabletop and retro look. This really is a great modern TV stand with a throwback touch that we can’t get enough of. Assembly is easy and won’t take you any time at all, so you can get straight to using it in your beautiful living room! We know you’ll love it if you try it!